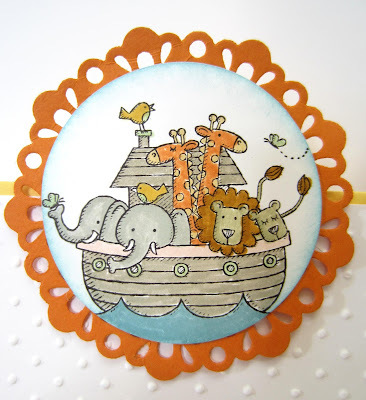 Have you noticed the darling stamp, Two by Two, found on page 60 of the big Stampin' Up! catalog? I did -- right away! This ark full of cute animals was just begging to be put on a baby card. the size that is used for a 4 1/4" x 5 1/2" card. the edges of the circle, I also sponged the edges of the "congratulations" label. Fold a 8" x 4" of Daffodil Delight card stock in half, creasing well with a bone folder. the largest of the circles and run through the Big Shot. Use the Paper Piercing Tool to poke out the little pieces in the orange doily. 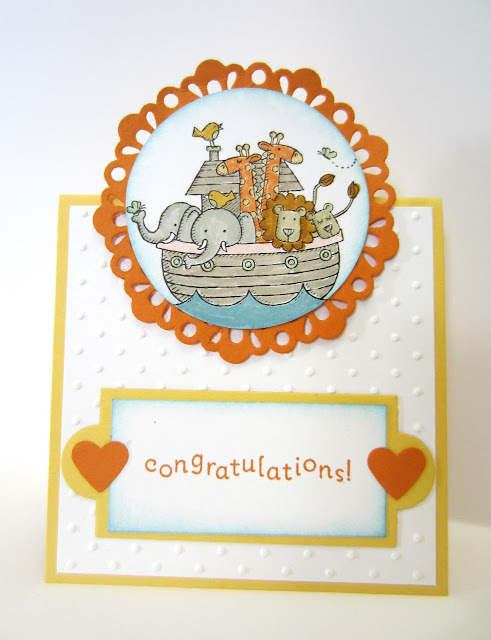 In Basic Black ink, stamp the Noah's Ark image on the white circle. Use your choice of Stampin' Write Markers to color the image as you wish. Sponge Baja Breeze ink all around the edges of the circle. Adhere the colored circle to the orange doily. Stamp sentiment in Pumpkin Pie ink in the center of a 1 1/4" x 2 3/4" piece of Whisper White card stock. Sponge the edges with Baja Breeze ink. Adhere this piece to the Daffodil Delight tag. Use the Small Heart punch to punch out two orange hearts, and adhere these to the sides of the sentiment piece. Adhere dotted piece to card front, and do the same with the sentiment piece. Put three Stampin' Dimensionals only on the LOWER HALF of the colored image, and attach to card front, with the top half of the image extending above the fold of the card. I love this stamp! I had not noticed it in the catalog but I will definately look it up! Such a cute card! You did great on the coloring. Going to have to look for this one. I love all of the card ideas you linked up this week. Lovely. Oh the cuteness. That stamp is adorable. And I love the colors, too. It's amazing that you can do this, the cards I've seen here today are wonderful! That's delightfully adorable! One of the types of cards I would keep forever in a baby album after having it displayed on the mantle or something for a long time after a babe was born!!! Thanks so much for sharing your lovelies with us for my party!! Awww...such a cute stamp! Thanks for sharing this at Romance on a dime!! Adorable. We have a friend that named their son Noah. How appropriate would this be? :D Thanks for sharing.